While freestyle is the dominant form most commonly associated with the term "footbag," there are a number of different sports and disciplines under its umbrella that vary in nature, including, respectively, net, golf, and freestyle, and foursquare, doubles, and consecutives. The counter-part to freestyle, and the second most prominent footbag sport, footbag net is essentially volleyball with the feet. It includes both singles (one-on-one) and doubles (two-on-two) disciplines; however, unlike other net sports such as tennis, doubles is more popular than singles due to the inherent difficulty of the latter. Like freestyle footbag, players kick a small, stitched, golf ball-sized bag, filled with plastic pellets, over a 5-foot-high net. However, unlike freestyle bags, net bags are made of a stiff leather that increases kicking distance, yet decreases accuracy. Special shoes are used and modified accordingly to create as even surfaces as possible for improved control. Photo: Footbag net doubles competition, by the IFPA. Games are played up to 11 points, according to classic scoring, with teams switching court sides at 6 points. A team can only score on their serve and kicks must be alternated by players. 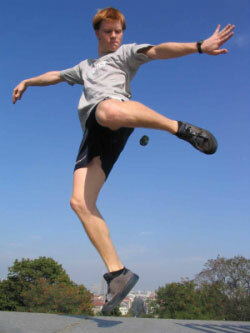 In North America, footbag net is most popular in San Francisco and Montreal. The World Championships are held alongside those of freestyle footbag, annually, albeit with significantly different environmental requirements (grass or astroturf fields, or indoor gym flooring). Practiced since 1982, footbag golf follows the same essential rules as traditional golf, yet is played with footbags of various sizes, densities, and materials on a significantly smaller course. While previously a more formal event, it is now most commonly practiced as a leisure, post-freestyle activity at tournaments, employing natural surroundings as the course, much like casual disc golf (for example, using a landmark such as a tree trunk as a "hole"). Photo: Footbag golf, by Footbag Canada. As stated in What is footbag?, freestyle footbag is the act of performing series of consecutive tricks of varying difficulties with a small, filled bag through the combination of various core elements. It is foremost a non-competitive and individual sport. It is highly accessible as it requires no team or partner, simply a well-lit, non-slip flat surface, and little and inexpensive equipment. Yet, while it is possible to perform individually, players benefit invaluably from circle play (wherein the bag is passed from player to player in turn), feeding off of the creativity of their peers; this is particularly the case for new players. Photo: Paul Cronjaeger, by PlanetFootbag. Tournaments are composed of a number of events, the most common of which include 2-minute routines, 30-second shred, and circle contest. Routines are performed individually and choreographed to music and judged on a number of criteria such as creativity, number of drops, uniqueness and variety of tricks, difficulty, stage presence, and musical cues. Dropless routines are somewhat rare and garner a particularly high score. In 30-second shred, athletes perform as many unique tricks of as high a difficulty as possible within the allotted time, usually averaging one trick per second. It is scored strictly on technical merit with the following formula: ((difficulty / total tricks) x unique tricks) + difficulty. Again, players perform individually, with strictly punished drops. Finally, circle contest is composed of pools of 3-5 players taking turns performing strings of tricks for as long as possible. It is divided into 2 rounds, each consisting of 4 turns per player. In the first round, the primary judging criteria is variety and uniqueness of tricks; the second round is judged based on density and difficulty. While judging is far more subjective, this event is the truest test of raw freestyle skill as it employs the natural format in which players train and play for pleasure. Foursquare is played in a standard four square ball court, where players kick, stall, or perform tricks or fake-outs to win. Players each occupy a square, with one "king" square within which a player may score a point upon the rally following his or her serve. Points are scored by the footbag either landing in another player's square, or another player kicking the bag outside of court bounds. In the former example, the player in whose square the bag lands is out, and moves to the furthest square from the king, while any players in squares behind him or her shift forward a square toward the king position. In the latter example, the player who kicks the bag out of bounds is out and moves to the last square. Games are played to 11 points, players maintain points if sent back to the last square, and tricky serves and spikes are not allowed. Additionally, the king may propose a rule prior to a serve, which is introduced if one other player agrees. Rules can stack and are limitless; they can include concepts such as "players can only use their left leg," or "a player must perform a spin before 'passing' the bag." The king can also veto rules in the same manner. Photo: Doubles partners, Tomas Tucek and Martin Sladek, by UniqueTrio.com. Formerly a prominent event at the world championships, doubles is a form of freestyle in which two players coordinate together to perform single tricks with two sets of legs weaving between each other. Doubles routines are allotted 3 minutes as opposed to the 2 minutes for standard routines. Consecutives is a former event in which an individual player performs as many consecutive, alternating inside kicks as quickly as possible. It has fallen out of favour primarily due to its monotony, as the majority of players that compete in freestyle events can easily kick over 1000 contacts (taking approximately 15 minutes). Consecutives champion, Ted Martin, however, holds a Guiness World Record with 63,000+ kicks, at a time of almost 9 hours.